At the centenary of the end of World War I, how can we build peace? The First World War was a brutal conflict, one that led to unimaginable levels of suffering, violence and death. My great-grandfather, Charlie Day, survived the Battle of the Somme and the First World War, but nevertheless, according to my Granny, he still suffered from the after-effects of a mustard gas attack for the rest of his life, eventually dying of lung cancer. His story is just one of millions that could be told. In his poem To Any Dead Officer, Siegfried Sassoon refers to the incredible sacrifice made during the First World War in order that we may live and ​“work in peace with Time for friend”. The peace that was brought about by the end of the First World War was a peace built upon the sacrifice of millions. Remembrance Day helps to ensure we never forget that peace is built upon sacrifice. 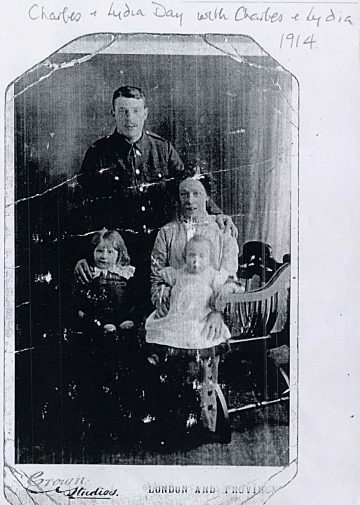 Charlie Day and his family, 1914. Typical conceptions of peace often involve wondering through an idyllic countryside scene, gazing upon cinematic skylines or sitting in a boat resting on a serene sea. In contrast to this, peace and reconciliation, between nations at war, friends or family who have fallen out or ultimately between God and humanity, is built upon costly sacrifice. Sadly, violence still afflicts our country and wars continue around the world. At times, due to the level of violence and war in the world, it can seem overwhelming and hopeless. Despite this, the resurrection of Jesus encourages us that even in the darkness of death, there is hope, and as disciples of Jesus we are called to be harbingers of hope amidst present pain and conflict. The lengths to which God has gone to reconcile the world to Himself shows us the importance God places on making peace between those in conflict. If we are to share in this ministry of reconciliation, we need to acknowledge that to be peacemakers is a costly affair. Yet I think there are small steps we can all take to bring peace and reconciliation in our lives, towns and the wider world. I wonder, who are the people in our lives who we need to be reconciled with? What actions could we take to restore those relationships? Where in our communities is there discord? How could we be peacemakers in that situation? Which countries in the world are crying out for peace? Will we commit to pray for peace to be found in those nations? The one who we are called to bear witness to is a crucified king, and as His ambassadors in this world we will have to make sacrifices if we want to be His peacemakers. Yet the costliness of Christ’s death and the hope of his resurrection reminds us that peace and reconciliation are worth fighting for.